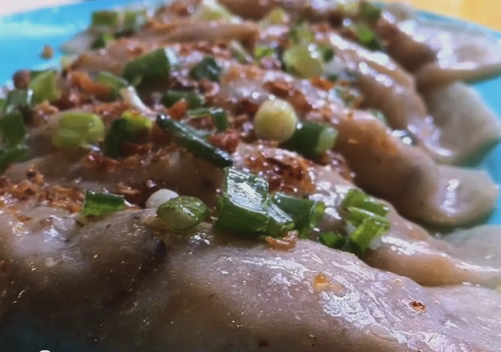 Soon Kueh is a steamed Chinese dumpling shaped like semi-circle made of rice flour skin with shredded turnips, mushroom and dried shrimps. The best soon kuehs have skins that are translucently thin, but yet retain a slightly chewy texture – a Singaporean morning or afternoon snack. Soon Kueh is also literally mean Mushroom Dumpling. 1. Fry garlic till they are dark brown in colour. 2. Add the dried shrimps, diced mushrooms, chicken strips and white pepper to garlic. 3. Add turnip and some chicken stock. Final filling should look slightly moist in texture and light brown in colour. Set aside. 1.Mix both flour together in a huge glass bowl and add cold water to mix till smooth liquid is formed. 2.Boil the 450ml water in a pot and then stir in the salt. 3. Pour the dough liquid into the boiling water, mix thoroughly till the mixture thickens. When dough is almost done, remove from heat. 4. Allow dough to cool before making the kueh, as it will not otherwise not be pliable and will tear. To make the soon kueh, roll the ball into a flat disc. Spoon some filling onto the wrapper and the edges together to seal then twist patterns along the edges. Steam on a greased tray lined with banana leaf for 12 minutes. Brush some garlic oil over kuehs – prevents sticking. Serve Soon Kueh hot garnished with fresh chopped chives, fried shallots, sweet soya sauce and chilli sauce.